In this current time, a bold and fresh approeach is required from servant leaders. The Backless Seat is a clarion call to return to dependence on God (and him alone) for the completion of one's Kingdom assignment. The servant leader will experience their greatest results as they yield to the skillset of proper posture versus one's popular position. This style of service and influence is often overlooked, frequently ignored and hastily abandoned. In retrospect of past and current methods of leadership, there are obvious inconsistencies that now cause spiritual leaders to be performance-driven instead of principle-based. There is a plea from the heart of God that in spite of the mass exit from our foundations, there must be a mass return of the exiled in the foreign land of leadership to hear and answer the call of God and model proper behavior before this emerging generation of seekers. Where are those who will pursue the Ark of the Covenant, and position God's presence back to its proper place? 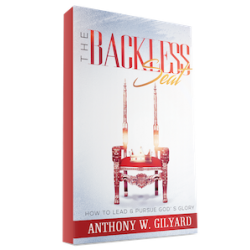 In this book Anthony Gilyard prepares, builds and develops leaders to do all that is necessary to find the glory and maintain the Glory!